After some 15 years on a volunteer project, pouring over hundreds of photographs for a seminal volume on San Jose’s Japantown, you would think that it would be easy to walk away once that project was complete. 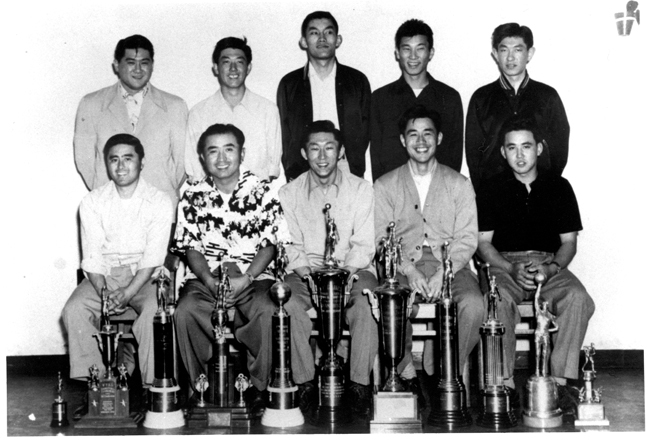 But not for Japantown photographer and businessman James “Jim” Nagareda. A new opportunity arose to further document the history and life of San Jose’s ethnic enclave, and the Sansei jumped on it. 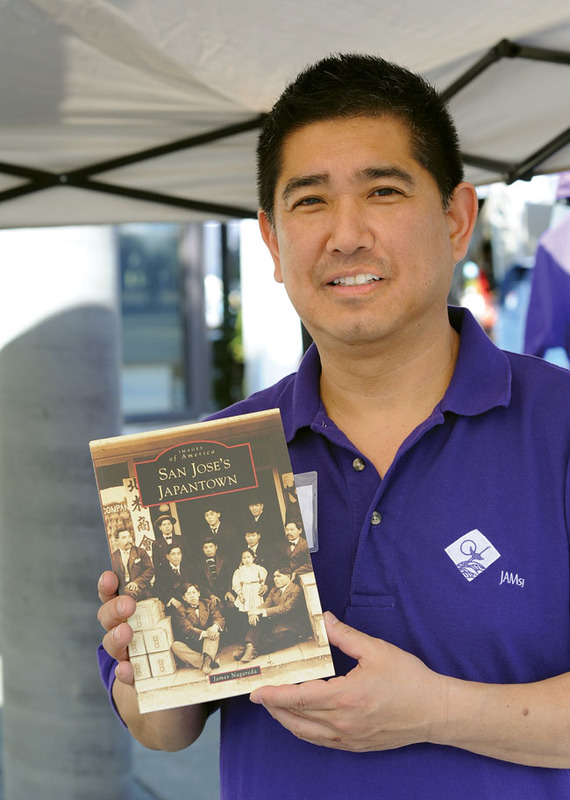 Nagareda, 55, served as the project lead for larger “San Jose Japantown: A Journey,” a 470-page volume written by Curt Fukuda and Ralph M. Pearce in 2014 and published by the Japanese American Museum of San Jose. And while that tome — which Nichi Bei Weekly reviewer Art Hansen referred to as “elegantly composed and precisely edited … infused with well-chosen stories that are both meaningful and memorable” — had a hefty mass and weight, the new project was decidedly slimmed down. The nature of Nagareda’s new 128-page Arcadia Publishing book, simply titled “San Jose’s Japantown,” is much more portable and thus accessible, following the rather formulaic format that has helped to capture thousands of communities across the country in Arcadia’s “Images of America” series. The series is marked by sepia-toned covers. The Nichi Bei Weekly spoke with Nagareda, who has owned his own Japantown photography business since 1990 — among several other local businesses — about the Arcadia book after he was named as the first executive director of the Japanese American Museum of San Jose earlier this year. Published in April, “San Jose’s Japantown” consists of 211 photos with captions, capturing the life and times of the historic 127-year-old community — one of the last three Japantowns left in the country. 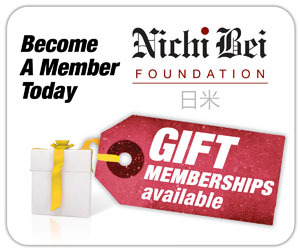 Nichi Bei Weekly: You had a role in the larger book on San Jose’s Japantown. What made you decide to work on the Arcadia book? 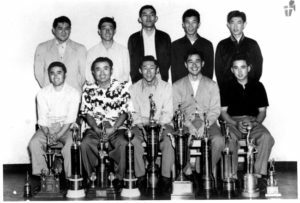 James Nagareda: While we were working on the big book, Arcadia had contacted us, because they wanted someone to write a history book on San Jose’s Japantown. At the time we told them ‘no way,’ we wanted to finish this book first. After we finished that project and caught up on our sleep, Curt Fukuda and Ralph (Pearce) were basically burnt out, but they said if I wanted to do it, they would support me. So there’s a lot of overlap, and a limited number of photos, but about a third of it are new photos. As I was researching, I came across more and more photos. So there could possibly be another book coming out. We’ll see. NBW: So two-thirds of the Arcadia book has the same photos as the big book? JN: One of the comments I kept hearing was the other book was so big and heavy, people don’t take it out every day to look at it. But the Arcadia book is small, easy to go through, and very little reading. So people are really enjoying (the Arcadia book). The price is great too, it’s $22, versus $60 (for the big book). So to me, if that’s the way to get exposure for Japantown, then let’s keep that going. Maybe we’ll come up with some other books, some other topics. JN: That’s what I think about. 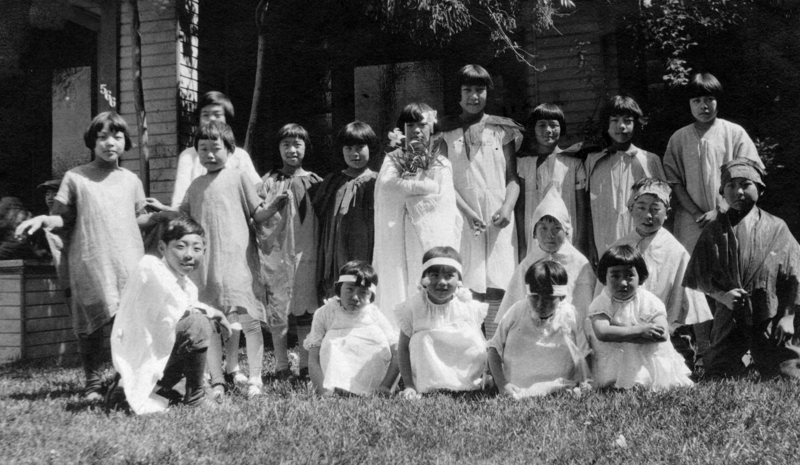 Children are dressed up for an Easter parade, circa 1925 — From left to right (first row): Easu Shimizu, Doris Nakahara, Michiko Yamada, Emi Kimura, and Ellen Okagaki; (second row): Sam Takaichi, Dan Ono, and Carl Shimizu; (third row): Bertha Kawakami, Yaeko Ono, Aya Mineta (behind), Grace Okagaki, Martha Takaichi, Tsuguyo Okagaki, unidentified, unidentified, Clara Kawakami and Lena Takaichi. NBW: In what ways is the focus different from the big book? JN: In the big book, they had to very much follow a storyline. But in the Arcadia book … the focus was on the people. … I think the people make up the community, as far as the spirit, so that’s why I wanted to include more on the people. … For Arcadia, you had to use so many photos, you had to fit within a certain word count. JN: No. But I would say that when you tell a story about a photo, there may be one or two more stories that you’d want to tell. But you’re limited in space. NBW: Who is your audience? JN: If it gets to the broader community, it’s great. NBW: Are you satisfied with how it came out? JN: The feedback has been really good. There were newspaper articles that I submitted, but were rejected partly because of copyright and also quality. 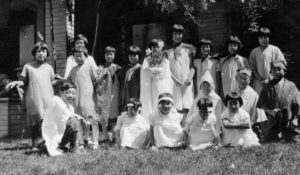 … One of the stories was a couple of years after people came back from camp, the JACL (Japanese American Citizens League) sponsored a beauty contest. It just showed how the community wanted to get back to the normal, everyday life. NBW: What, in your opinion, makes San Jose’s Japantown so unique? NBW: Would you say it’s a tourist destination? JN: Yes, I would say so. 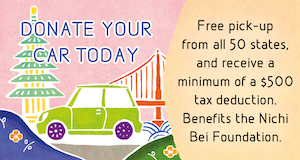 Even the city helps to promote Japantown as a unique neighborhood. NBW: It seems like it’s very uniquely ‘JA.’ You don’t hear Japanese spoken as much here. Would you characterize it as being more specifically ‘Japanese American’? JN: Yes, very much so. We used to get more Japanese nationals, from companies like Toshiba, but they stopped bringing people from Japan. Those people are not coming over anymore, and we don’t see them in Japantown like we used to. NBW: Do you kind of attribute that to the Japanese businesses on (San Jose’s) Saratoga Avenue? JN: If you look at that compared to what we have here, we’re very ‘Japanese American here,’ very different. If Nijiya wasn’t here, then we would probably see a lot fewer Japanese nationals. JN: Their clientele has really changed. Probably more Chinese than Japanese now. Things are changing. One of the things I noticed… The Nisei, if they find a restaurant, they like to go there all the time. Whereas the millennials, they are constantly looking for the newest thing. Whereas our generation, we like to go to the same place, because we know what to expect. 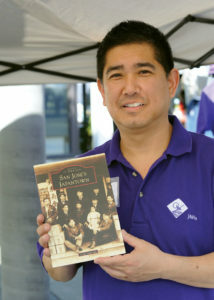 To purchase “San Jose’s Japantown,” visit https://jamsjonlinestore.myshopify.com, e-mail: store@jamsj.org, or call (408) 294-3138. 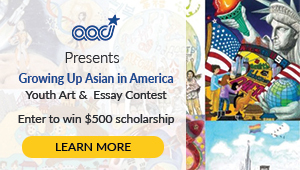 You may also visit Thursday through Sunday, 12 to 4 p.m., at the Japanese American Museum of San Jose, 535 North Fifth St. in San Jose’s Japantown.